These Chocolate Chip Muffins are so good for you that you can’t consider them a treat! Made mostly of almond flour, they’re nutritious, lower in sugar and carbs than most muffins, free of most common allergens, Paleo and vegan. 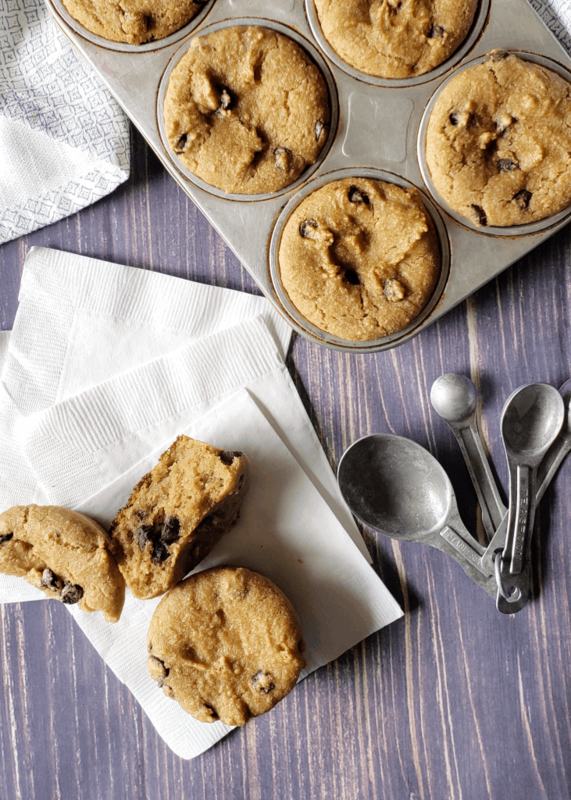 Treat yourself and nourish yourself with these grain-free chocolate chip muffins! Believe it or not, these Healthy Chocolate Chip Muffins were inspired by Starbucks’ chocolate chunk muffins. Hopefully I didn’t lose any of you by making that confession. Stay with me, folks. I will explain, and I promise the recipe is worth it! The holidays and two months that followed were a blur. I was so busy that I could barely remember my first name and felt like a hot mess most of the time. 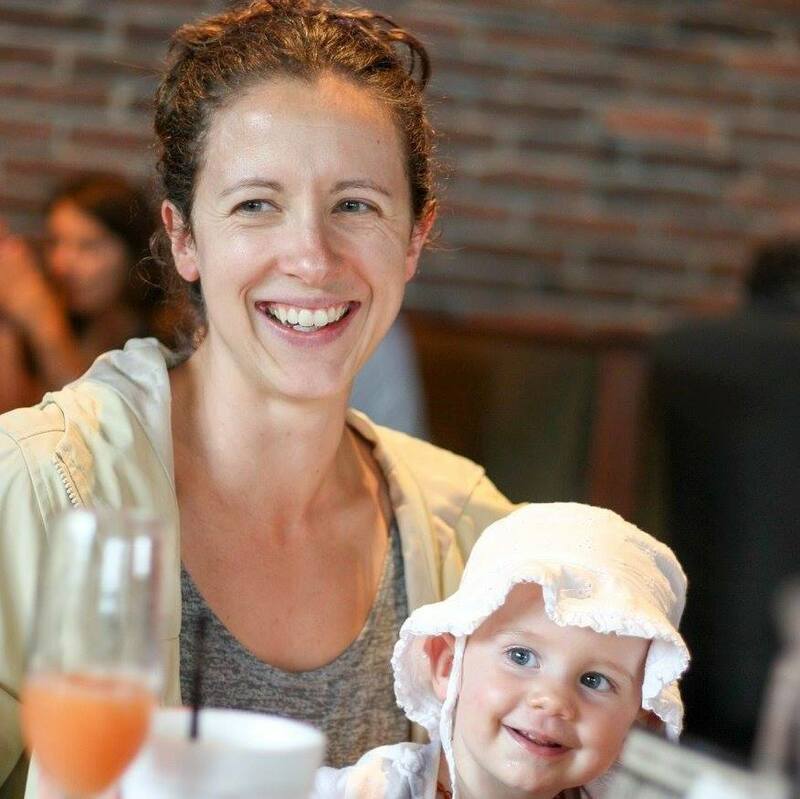 I tried to stay on track with planning out healthy meals, grocery shopping and cooking nourishing meals for my family, but life doesn’t always go as planned. More than once, I found myself in the Starbucks drive-thru desperate for coffee and something to feed my kids. Being desperate and sleep deprived, I didn’t say “no” when my son requested a chocolate chunk muffin. I knew it was loaded with gluten and sugar and didn’t offer many nutrients for his growing body, but no mom is perfect. *sigh* At least I learned a couple of things from those muffins. One, that my son absolutely loves chocolate chip muffins! Two, the muffins confirmed that like me, a lot of gluten-containing foods give him a tummy ache. Not only are these Chocolate Chip Muffins loved by adults and kids alike, they’re free of eggs, dairy, soy, corn, and gluten. 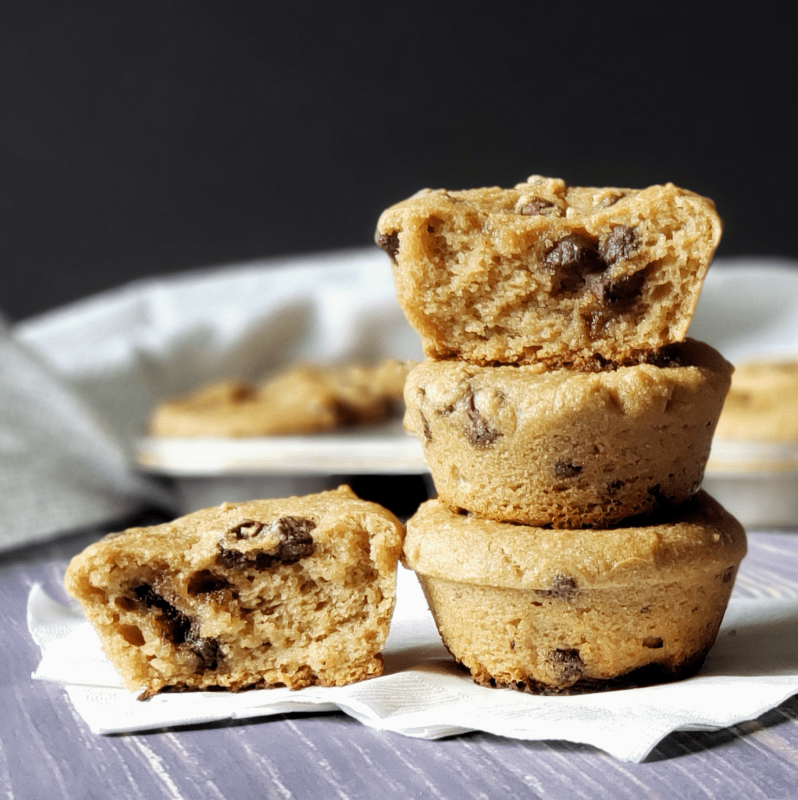 Thanks to cassava flour, these Chocolate Chip Muffins are not only gluten-free, they’re completely grain-free! But don’t worry, these muffins aren’t crumbly or gummy like most gluten-free and vegan baked goods. These Chocolate Chip Muffins are moist and have great texture and structure, all without xanthan or guar gum! Hold on, it gets even better. This recipe also uses minimal amounts of natural sweeteners, meaning that they contain less sugar than most muffins and still fall under the Paleo-friendly category. Yippee! Not only are almonds packed with nutrients, they also contain more protein, fiber and fat and less carbohydrates than regular wheat or gluten-free grain flours. That combination means that these muffins will help to balance your blood sugar levels instead of spiking them. Balanced blood sugar is important in its own right, but did you know that it also helps you maintain a healthy weight? 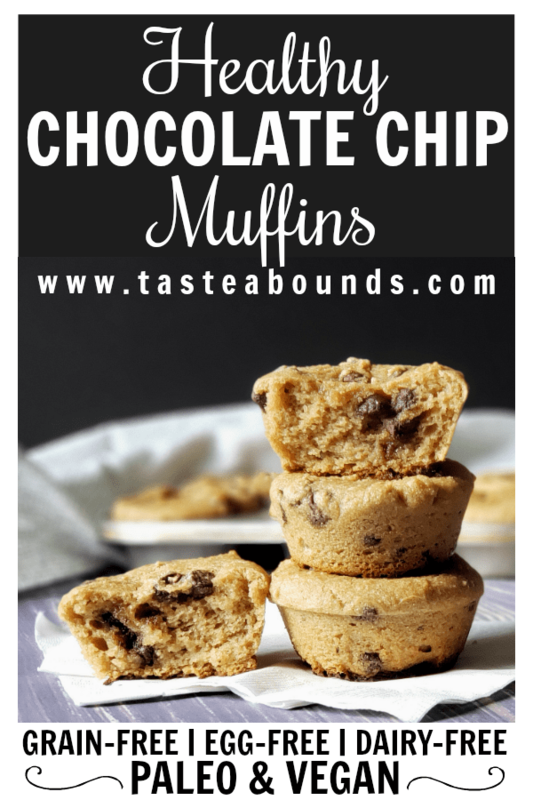 Yes indeed, these Chocolate Chip Muffins are satisfying in every way and a huge improvement from muffins made with grain flour! Unsweetened is crucial because we are trying to minimize the sugar in this recipe, and regular non-dairy milks (those that don’t say “unsweetened”) contain a ton of sugar. But beyond that, you can choose to use a plain (unflavored) or vanilla flavored non-dairy milk. Either one plus the proper amount of vanilla will provide the vanilla flavor that is so important in chocolate chip muffins. My favorites are SoDelicious unsweetened vanilla cashew milk and SoDelicious plain unsweetened coconut milk. As I noted above, almond flour makes up most of these muffins. It’s a wonderful ingredient that can be used to make delicious baked goods that are grain-free, gluten-free and Paleo diet-friendly. However, it can be pricey. I’ve found almond flour to be most affordable at Costco. You can see it in my post on 30 Organic Pantry Items to Buy at Costco. Since this post, Costco has come out with their own “Kirkland” brand of almond flour for even less money! A 3 lb bag is around $11, which is a steal for almond flour. If you don’t have a Costco membership, you can also buy generic almond flour at Natural Grocers (in the refrigerated nuts and flours section). Almond flour can also be found at an affordable price on Amazon. There are several options, as you can see below. Cassava what??? 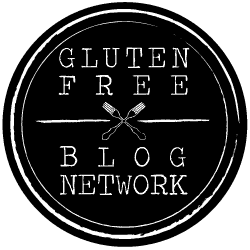 Cassava flour is one of the latest trends in gluten-free and Paleo baking. It is made from the same plant as tapioca starch, but instead of drying the starchy liquid extracted from the cassava root to make tapioca starch, cassava flour is made by peeling, drying and grinding the whole root (source). As a result, cassava flour ends up with very different properties than tapioca starch, properties that make it a great flour for Paleo, grain-free and gluten-free baking. Since cassava flour is relatively new to the market, it can still be expensive and difficult to find, but I am here to help with that! Whole Foods and Natural Grocers both sell Otto’s brand of cassava flour, but Otto’s is honestly the most expensive brand. I buy Anthony’s Cassava Flour from Amazon, which you can see below. It is far less expensive than Otto’s and highly rated. The chocolate chips you use will determine whether or not these chocolate chip muffins are allergy-friendly, vegan and/or Paleo. Enjoy Life chocolate chips are vegan and free of gluten, nuts, dairy and soy. They also taste great and are considered an acceptable treat by most Paleo gurus. These are what I use. I buy them at Natural Grocers because they are priced far lower at Natural Grocers than Whole Foods. You can also buy them at VitaCost for a great price here. VitaCost has their own brand of mini chocolate chips that are sold at a great price. They contain soy lecithin so they are not Paleo, but they are gluten-free and vegan. 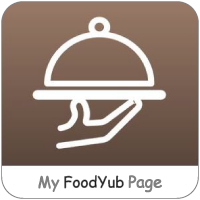 If Paleo is not your thing, these are worth checking out by clicking on the link above. Vitacost also sells their own brand of dark chocolate chunks that are free of soy lecithin. You can find those here. Lily’s dark chocolate chips are sweetened with stevia and erythritol, making them a great low-sugar option. They can be found at health food stores like Natural Grocers and they are available on VitaCost, and online natural food and supplement retailer that I use frequently. Click here to buy them online and have them shipped to you in just a few days! Using a silicone muffin pan will not only save you money since you won’t need liners, it will also make your life much easier! Well, at least when it comes to making anything muffin-related. I didn’t even grease the muffin cups to make the batch you see in these photos. The muffins just pop out, and the pan cleans up in a snap. It’s so easy, and these snazzy pans are only about $10 on Amazon! I bought the Keliwa brand silicone muffin pan that you see below and have been very pleased with it. Now that you know all of my tricks, let’s get on with the recipe! These Chocolate Chip Muffins are so good for you that you can't consider them a treat! Made mostly of almond flour, they're nutritious, lower in sugar and carbs than most muffins, free of most common allergens, Paleo and vegan. 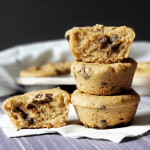 Treat yourself and nourish yourself with these grain-free chocolate chip muffins! In a large bowl, whisk together the dry ingredients. Whisk the wet ingredients together in a separate bowl. Combine the wet with the dry and stir with a sturdy spoon before folding in the chocolate chips. If you are using a silicone pan, you can grease the muffin cups lightly, but I have not found it to be necessary. If you are not using a silicone muffin pan, line the muffin cups with paper liners. Spoon the batter into the muffin cups and sprinkle a few more chocolate chips on top of each one. Bake for about 30 minutes. Let cool in the pan for about 30 minutes before moving to a wire rack. Preheat oven to 350 degrees Fahrenheit. In a large bowl, wisk together the dry ingredients. Wisk the wet ingredients together in a separate bowl. Combine the wet with the dry and stir with a sturdy spoon before folding in the chocolate chips. If you are using a silicone pan, you can grease the muffin cups lightly, but I have not found it to be necessary. If you are not using a silicone muffin pan, line the muffin cups with paper liners. Spoon the batter into the muffin cups and sprinkle a few more chocolate chips on top of each one. Bake for about 30 minutes. Let cool in the pan for about 30 minutes before moving to a wire rack. Let them cool completely for the best results, if you can wait that long! If you make these, I’d love to hear your thoughts. Please share what you think in the comments below. Enjoy! Wow, this recipe will be totally delicious. Your health will always be your top priority. Always eat healthy and live a healthy lifestyle. Wholesome ingredients, and super tasty! A great after school snack, thanks! What a fun treat! I love that there is no extra sugar added using the applesauce instead of refined sugar! Awesome! You had me at chocolate!!! I’ll bring the tea and coffee next time you make these!! Those look sooooo delicious! I seriously want one right now. haha. 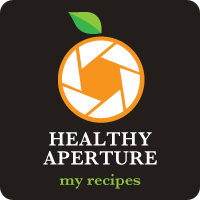 I love the applesauce and that they’re naturally sweetened, too! Chocolate chips are so lovable, and muffins are the best. How fun for you and your son to share these. And I always appreciate egg-free baked goods! These are so cute! And I happen to have all these ingredients on hand so I’m totally making them this week! Yes please on everything chocolate chips! These muffins are so cute and scrumptious, and so perfect for a snack on the go! These are so adorable, sweet and tasty! Perfect for the little ones and the grown-ups, too! THese look so good! I have not tried using casava flour yet, but I will when I make these soon! I love muffins made from almond meal, they have such a great texture! These look super tasty with the chocolate chips in them, my little boy is going to love these! I agree! Almond flour lends the perfect flavor and texture to gluten free or grain free baked goods. I hope your little guy enjoys them! Going to make these for my niece. I appreciate all the options you offer and the great instructions! Thank you, Carol. I hope your niece enjoys them!